Etna (Sicily, Italy): Tremor has remained elevated and the New SE crater continued to produce weak strombolian activity and aliment the lava flow during much of the night. At the moment (Sunday morning), it is not clear if this activity is continuing. The paroxysm yesterday ended around noon, after about 12 hours total of activity from the New SE crater which consisted in gradually increasing strombolian activity that merged into lava fountains after midnight. The lava fountaining reached its peak in the early morning hours (6-8 am local time) with heights of 4-600 m above the crater. 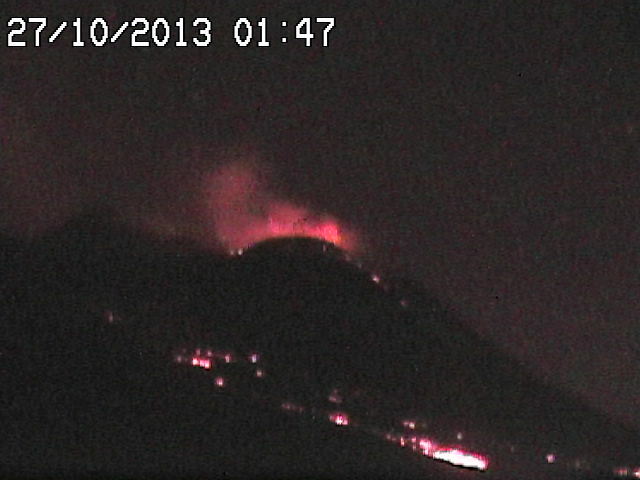 Strong ash and steam emissions continued to produce an impressive plume rising about 10 km above the volcano, i.e. to an altitude of 13 km (30,000 ft) and drifting SW. A relatively small lava flow was erupted from the saddle vent between the old and new SE crater, traveled south and then east into the upper Valle del Bove, reaching a length of approx. 0.5 km. Sinabung (Sumatra, Indonesia): A new explosion occurred yesterday evening (17:40 local time), producing an ash plume rising 2-3 km above the crater and causing ash fall in nearby villages.